A model and an example to follow in the way of life. With gratitude to God, on April 25th this year, we held the 85th birthday of Sr. Athanasia Simon OSB. Still strong, still eager to offer her service in our priory house and outstations. We planned to celebrate some days later on May 2nd so that we may join it with Sr. Sigirada. 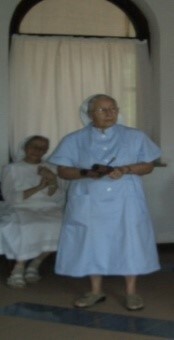 Sr. Athanasia requested that we should not have a long program for her. Acknowledging her presence, we were willing to celebrate but on the other hand we respected her wish, of course we could not let it pass by. We came an agreement to have a solemn mass presided by Abbot Dionys OSB. After the mass we came out in procession, singing and dancing with our drums to the community recreation.